A friend of mine from college is one of the owners of the "Big Red Barn" in Santaquin, Utah. 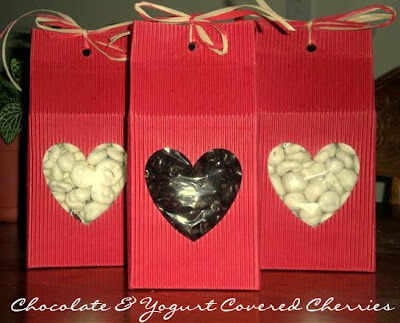 And, in keeping with the Valentine spirit of this blog this month, she wanted to offer one of Love, Actually's followers one of these cute little packages of chocolate or yogurt covered cherries! Fun, right? Thanks, Chelsea! 2. Visit southridgefarms.com - they've got lots of fun stuff on their site! Giveaway ends Friday, February 5! I'm both a follower of Love Actually and fan of the Red Barn. Visited southridgefarms.com - love the pic of the red barn in front of the snow covered mountains. beautiful! I'm a fan of Red Barn on Facebook! Enter me in this sweet giveaway, I'm a happy follower! I'm a follower of Love, Actually. I absolutely love your ideas and creativity. You're amazing! I'm a fan of The Red Barn on Facebook. Their stuff is adorable and cherries sound delicious! I voted for your blog too! I checked out the southridgefarms.com site. I am a follower and a fan, and voted for your blog! southridgefarms.com I was browsing there Recipes and I thought that the Cherry Buttermilk Scones look and sound AMAZING!!! I love yummy prizes. I follow your blog and am a fan of Red Barn on Facebook. I visited Southridgefarms.com also. I have been thinking of going there for a few months, but had forgotten. Thanks for the reminder! I'm a facebook fan of Big Red Barn! Visited southridgefarms.com. The cherry buttermilk scones look delicious!! I voted for Love, Actualy at Top Mommy Blogs! am a fan of both on fb. visited & bookmarked their site for later shopping! these yogurt covered cherries would be perfect for our Valentine's weekend away w/friends! I voted for Love, Actually! Good luck!! Wow--I visited their site and I'm riveted by the beautiful photo on the home page. It's gorgeous!! I wanna vacation there!! follower and fan of both!! I became a fan also! I visited southridge farms. I was so delighted to see they have yogurt covered cherries! I follow your blog! ;o) Thanks! I am now a fan of Red Barn on FB! Thanks for the chance! Chocolate covered cherries are my FAVORITE! Curious about the yogart ones, too. I'm fasting from chocolate for all of 2010, so i would try those, anyway. And those little red heart bags are DARLING, too. I'm a follower & now a fan. Pick me! I'm already a follower of Love Actually...and Love it! I have voted for Love Actually on Top Mommy Blogs..of course I gave you guys a 10! I vistied southridgefarms.com and have added it to my favorites!! follower and fan -- thanks! I follow Love, Actually. The yogurt covered ones sound EXTRA yummy. Fan of Red Barn on facebook too. I visited South Ridge Farm and the Cherry Lovers Special Gift Box sounds good. 2. I had no idea the red barn had a fan site and I am so glad you showed me I love that place!!! and it's yummy ice cream! so i'm a fan! count me in! I didn't know they had a site, I want everything on it! WOW thanks again! I'm a fan of Red Barn! I love their website! The snow in the background is so beautiful! I wished I lived in Utah to visit the store! I want one of everything! I am a follower of love actually and a fan of Red Barn on face book. I visited there website. The strawberry peach salsa sounds yummy. They have lots of good stuff I want to try. Maybe I can make a trip to Utah. I am a follower of you, and now a facebook fan of Red Barn! I visited the website- everything looks so good! I am a follower and a fan of Red Barn! I'm a follower of yours and I fanned BRB on FB. I visited that site. The picture on the home page makes me want to go visit. I <3 snow and I've never actually been in a barn! It's a beautiful photo! I am a follower and became a fan of The Red Barn on Facebook! My vote is in on Top Mommy Blogs! I visited Southridgefarms.com and I must say that the recipe for the Cherry Buttermilk Scones lookes delicious and I will be trying it!! What a great day to become a follower! I also became a fan of Big Red Barn! I voted for you on Top Mommy Blogs! YAY YOU! Visited their website. There are lots of great things. I love the Breakfast Feast box, that'd make a great gift. Hi! I follow your blog and also became a fan of Red Barn on facebook! Love your site! I am a follower of your blog and became a fan of The Red Barn! Steps 1 and 2, check: fan and follower! Voted for you on Top Mommy Blogs! Love you! Visited South Ridge Farms... OMG, the location is gorgeous! I would love to be able to visit there IRL. I would buy all of the snack items! I love those little bags of treats. Especially Moose Tracks. Yum! I am a follower of Love Actually and a follower of The Red Barn! I voted for your blog! I love it! I visited Southridgefarms.com - what a cool site. Thanks! I am a follower and a fan! This place is awesome, been there a few times! went to there site! everything is so yummy...I have tried several things! Ok, I don't know how to follow blogs, and I don't have facebook, but I just wanted to tell you that I am in LOVE with Love Actually! I just found your blog on Sunday when a friend of mine gave me the address. I think I've already read all your posts too! I made some mailboxes, and I did the Valentine Advent, and me and a goup of friends are planning an Amazing Race party, and SEVERAL more ideas ready! I've already told all of my friends about you, and we've spent a few hours laughing and giggling over some really great ideas. Thanks for this amazing blog! I will at least vote for you, I know how to do that! Definitely become a follower. Love all the great ideas! Also a fan on facebook! I'm qualified (follower and fan)! Just visited southridgefarms.com - can't wait to try their Cherry Buttermilk Scones recipe! Sounds delicious, esp with the oatmeal! A new fan. Both on facebook and your blog. Cute ideas. I am a follower, a fan of Red Barn, and have voted for Love actually on Top Blogs. Woohoo! I'm a follower of Love, Actually and now a fan of the Red Barn. I visited southridgefarms.com and I would like to try the Recipe for Easy Apple Cinnamon Pancakes! I am a follower and a fan of Red Barn. Following & a facebook fan! I'm a fan of TRB! I did both, but I wanted to add that I am so excited to follow this blog! I am a follower and i fanned the red barn. I am a follower of you and red barn, and i love all of your cute ideas. I am a follower and a fan! Fun giveaway! Hey! What a great idea! I actually live really close to The Big Red Barn! I think this would be a fabulous gift for my sweetie. I'm a follower, and I heart your site! And, here's a little comment to get me another little enrty! Happy Valentines day! oh my gosh i'm sooo excited for this.. my husbands mission presdent is the owner. we love the barn and visit it everytime we go to SL.. seriously the best best icecream in the world!! #2- can i just say i love your blog and i did the 12 dates for a year for Christmas and its been the best thing ever.. last month was melting pot this month bowling! #3 - i hope i win :) i have wanted to order something off their site for awhile and suprise him. I am a follower of Love, Actually and a fan of Red Barn on facebook. Maybe I'm stupid but I couldn't figure out how to vote. I tried a number of times.